After a series of credibility setbacks over the past year, the last thing the Everglades Foundation needs is another controversy. In the past two months, thanks to the help of the left-leaning newspaper TC Palm, the Foundation has benefitted from more than a half-dozen puff-pieces, all written without a single dissenting voice, in an attempt to paint a glowing picture of the locally headquartered non-profit group. Then PETA weighed in this week. PETA also has a video and blog post denouncing the cashmere trade. Neither the Everglades Foundation, nor the retailer, J. McLaughlin, returned messages seeking comment. The setback is only the latest in a long list of hits to the Everglades Foundation credibility. In addition to getting busted “cooking the books” on real estate values, and an accusation of improper financial disclosures from a watchdog group, Clemson University disavowed a study touted by the Everglades Foundation last year. 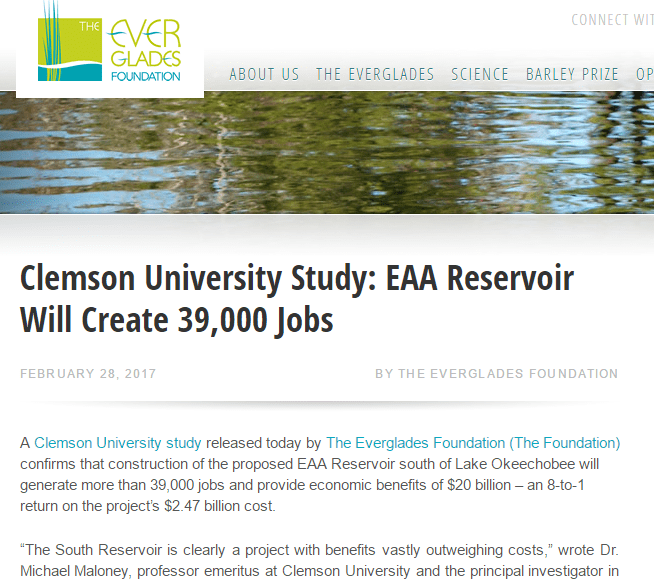 Clemson issued a public statement saying the university had nothing to do with the study, despite the Foundation blasting a press release touting a “Clemson University Study.” And in a separate incident, the South Florida Water Management District (SFWMD) discovered that the Foundation manipulated data used to model water storage scenarios. Both the disavowed “Clemson” study and the doctored data occurred in the midst of the Everglades Foundation’s campaign to convince Florida lawmakers to spend billions of dollars buying land for water storage. I call BS on PETA. Farmers have a big investment in their animals and do not shear Sheep just before winter. Come on let’s stop with insane theories. The above picture is of sheared sheep! Cashmere come from a breed of goats. The valuable fiber comes from its innermost winter coat. There would be no value to a pelt sheared prior to the spring. That’s a pic of a sheep! Poor job of shearing, that shearer would be told to leave and not come back to my farm. My sheep are all treated well, and I cannot afford my animals to be hurt either. Wool sheared does not hurt the animal and is a sustainable resource. It grows, just like your hair. You should support the wool business. Get your facts straight, you sound like a bunch of idiots when you post something like this.